LOCATION.--Lat 42°55'04", long 77°45'26" referenced to North American Datum of 1983, Livingston County, NY, Hydrologic Unit 04130003, on right bank 250 ft downstream from bridge on U.S. Highway 20 (State Highway 5), 0.3 mi west of Avon, 0.8 mi downstream from Conesus Creek, and 35.6 mi upstream from mouth. PERIOD OF RECORD.--August 1955 to current year. REVISIONS HISTORY.--WDR NY-82-3: Drainage area. The maximum discharge for water year 2016 was revised on Nov. 6, 2017, based on hydrographic comparison with streamflow records from Mount Morris (station 04227500) and Rochester (station 04231600). GAGE.--Water-stage recorder. 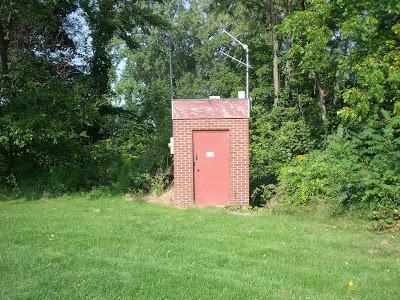 Datum of gage is 500.11 ft above NGVD of 1929 and 499.56 ft above NAVD of 1988. REMARKS.--Prior to 2000, possible diurnal fluctuation at low flow caused by powerplant at Mt. Morris. High flows regulated by Mount Morris Lake (station 04224000) and by Conesus Lake (station 04227980). Monthly figures of discharge and runoff August 1955 to September 1965 adjusted for change in contents in Mount Morris Lake. Water Years 2016-18: Records good except those above 500 ft³/s and those for estimated daily discharges, which are poor. EXTREMES FOR PERIOD OF RECORD.--Maximum discharge, 16,500 ft³/s, June 25, 1972, gage height 40.67 ft; minimum discharge, 47 ft³/s, Oct. 10, 11, 1980, gage height, 13.70 ft.
EXTREMES FOR PERIOD OF DAILY RECORD1.--SUSPENDED-SEDIMENT CONCENTRATION: Maximum daily mean, 2,680 mg/L, July 8, 1977; minimum daily mean, 1 mg/L, Nov. 27, 28, 1975. SUSPENDED-SEDIMENT DISCHARGE: Maximum daily, 39,800 tons, July 8, 1977; minimum daily, 1.7 tons, Nov. 27, 1975.